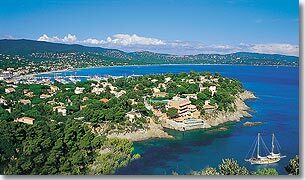 Situated on the cliff road (route D555) at the southern entrance to the Gulf of St. Tropez between Le Lavandou (20km,) and St. Maxime (22km.). 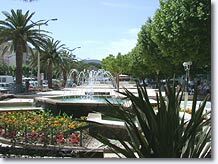 Cavalaire is located on the most southerly bay of coastal Var. The magnificent 3 kilometers long beach has made the reputation of this summer resort and the Pradels mountains that jut up behind, confirm it. 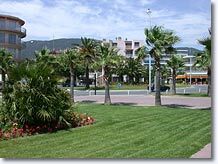 A paradise for sailors, Cavalaire has a modern, easy to get to port with 1,230 sheltered moorings. 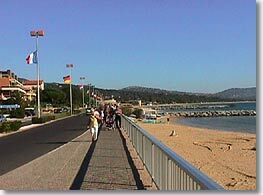 The sun shines warmly all year long and entices tourists to head out to some of the famous islands of the Mediterranean: the Levant islands, Porquerolles and Port Cros. On warm summer nights the streets and cafe terraces are filled with people.Outdoor concerts and shows are organized here and there throughout the city. A little sightseeing train tours around the city. The debarkation monument, the port. Romain ruins. 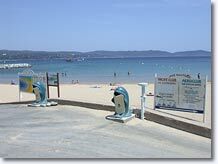 Scuba diving, sailing, deep sea fishing, water skiing, tennis, casino. 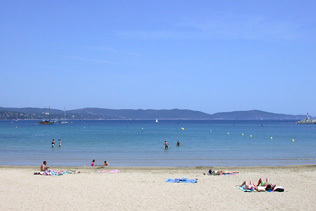 La Croix Valmer (6 km), Le Rayol-Canadel (9 km), Gassin (12 km), Saint Tropez (18 km).